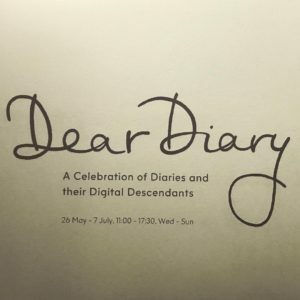 Dear Diary is an exhibition at King’s College, Somerset House, until 7 July, that is a celebration of the art of diary keeping in all its forms. From the early almanacs, through the diaries of Pepys, online journals and YouTube, they are all covered in an interesting collection that forms this small exhibition. In the archive you’ll find that I posted an entry from 2002 entitled “Give Us Our Daily Blog” which is a collection of daily blogs that I read. Most of the links are now dead and I don’t recall that much about many of them. I do know that one thing that appealed to me in the early days of web publishing was the very personal nature of the content; it was the kind of window on the world I don’t think we had seen before. Since then, we have become used to a never-ending stream of personal thoughts that pour onto the screen from blogs, social media and now YouTube videos. In the first days of the web it was like opening the padlock on somebody’s secret diary and reading their inner-most thoughts. Of course, we’re all used to it now and we all move the first things that pop into our heads onto a screen via a keyboard. Dear Diary is an exhibition at King’s College, Somerset House, until 7 July, that is a celebration of the art of diary keeping in all its forms. From the early almanacs, through the diaries of Pepys, Kenneth Williams, online journals and, now, YouTube, they are all covered in an interesting collection that forms this small exhibition. If you are in London before 7 July 2017 then you should go and see it (and you get to see inside one of the wings of Somesert House that you would not get access to unless you were a student). It was a thought-provoking exhibition and made me think about what element of these journals I’d like left behind. After all, a printed version of this site could hang around but – eventually – nobody will be paying for the hosting and I imagine my hosting provider will hit the big delete button. I’ve already commented this week, in the post about satellite dishes in New York, about my early online life which has already disappeared. What version of history does the web give us if much is deleted? How do you preserve an online diary for further generations? Sermon Of the Last Sunday is my attempt to ensure that there is something published on my site every month in 2017. You can read about my attempts to force myself to write or review the full #sols collection through the handy site tag, sols. In an earlier post I wrote about a visit to Japan or maybe your more interested in digital advertising. #sols has it all.